On the banks of the Canal Grande is a strange oriental looking building. It has pair of low towers linked by a two storey colonnade running the length of the facade. This is the Fontego dei Turchi, today Venice’s Natural History Museum but once the home of the Turkish community in Venice and an emporium for goods from the East. The right-hand tower of the Fontego dei Turchi. The Venetian word fontego is not easy to translate. It derives from the Greek word for hotel, πάνδοκος (pandokos) and entered Venetian through the Arabic فندق (funduq). It means a building where goods are stored and sold but also where the merchant lived. This describes perfectly the way in which the two most famous fonteghi, the Fontego dei Tedeschi and the Fontego dei Turchi worked. They were home to foreign merchants, but also where they stored and from where they sold their goods. Although a Venetian word, it is sometimes Italianized into fondaco (the word and the concept spread to other parts of Italy from Venice). The word fondaco has recently been used, perhaps somewhat controversially, on the signage for the luxury shopping centre which now occupies the Fontego dei Tedeschi. Interestingly the street signage around the building still has the word in its Venetian form. Since its foundation, Venice had always looked east rather than west. For historical and trading reasons it aligned itself with the Eastern Roman Empire led by the Byzantine Emperor in Constantinople rather than the Western Roman Empire eventually inherited by the Pope in Rome. This refusal to be dominated by the Pope was to lead, in the seventeenth century, to Venice being placed under a papal interdict and its government excommunicated. But I digress. When in 1453 Constantinople was captured by the expanding Ottoman Empire, it was to Venice that many fled, establishing the Greek community that still exists to this day around the church of San Giorgio dei Greci. Venice’s first reaction was to try and liberate the city leading to a period of war against the Turks. Eventually this turned into an uneasy peace in which Venice traded with the new leaders, but it often erupted into vicious wars over the next three centuries. And so it was that a community of Turkish merchants ended up in Venice. As the community grew, there was a general feeling among the Venetian government that they should be contained in one place. German merchants had been confined to the Fontego dei Tedeschi for a while and in 1516 Jewish merchants were made to live in the ghetto. The first proposal was made in 1574 and various buildings proposed and offered. But it wasn’t until 1621 that our building was given over to that purpose by Doge Antonio Priuli, who had bought it a few years before. A Veneto-byzantine well in the courtyard. The building started life as a palazzo of the patrician Pesaro family. In 1381 it was given by the Venetian state to the Duke of Ferrara, Niccolo II d’Este in gratitude for his help in the war against Genoa. At that point, the two towered palace would have looked like many on the Canal Grande, built as it was in the Venetian-Byzantine style. But over the next few centuries, as it passed through the hands of many different owners including two popes, Julius II and Leo X, unlike its neighbours on the Canal Grande it wasn’t modernized but remained in a now outmoded style. Shortly after it was given over to the Turks, the government ordered the demolition of the two towers as part of the renovation work it carried out for its new purpose. These renovations included the installation of a hammam, or Turkish bath, as well as the creation of a mosque. The building could accommodate about 300. The presence of Turks in the fontego outlived the the Venetian Republic. But by 1838 there was only one Turk living there, Sa’dullah Idrisi (who has gone down in history by the Italianised form of this name Saddo Drisdi). The governing Austrians wanted him out but he refused threatening legal action and claiming that San Marco himself (a.k.a. the Venetian Republic) had given him the right to be there. One day, he just disappeared and nothing more is known of him. In 1860 the building was bought by the town council of Venice who restored it to its former glory and rebuilt the two towers demolished in 1627. After the restoration it housed the Correr Museum (which is now located in the Piazza San Marco) and then from 1923 the Natural History Museum. The restored left-hand tower and front of the Fontego dei Turchi. The museum contains the usual suspects for a Natural History Museum from dinosaurs to local flora and fauna as well as geological information about the lagoon. But for me one exhibit stands out. It is the mummified remains of a cat, who was the beloved pet of Doge Francesco Morosini. The Doge led the Venetian fleet during the Siege of Candia, one of the last great Venetian conflicts with the Turks. The cat Nini went with him everywhere, even into battle and the Doge was inconsolable on his death. This brave little soldier is for me a very apt, if somewhat ironic, occupant of the Fontego dei Turchi. Nini, Doge Francesco Morosini’s beloved cat. Have you been to the Natural History Museum or seen the building? Did you know of its history? Have you seen Nini, the Doge’s cat? Oh, yes, I have been there twice, and I wish I had been able to read your information before I went there. 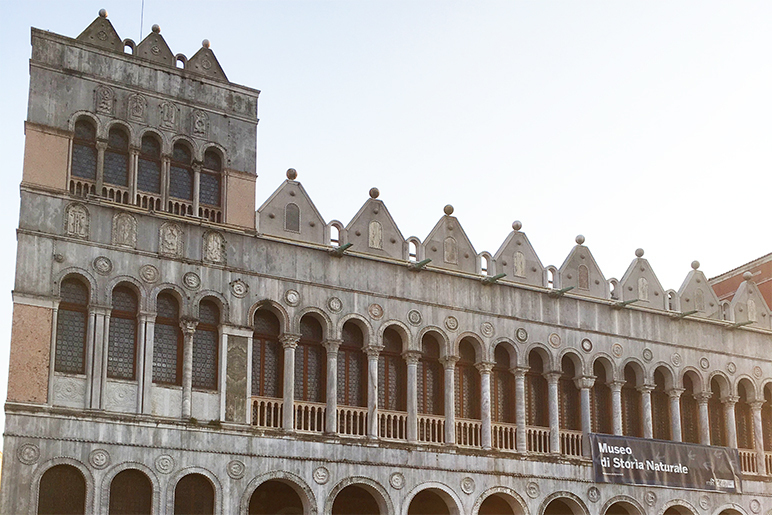 Venice, there can’t be a city like it for intriguing history. Venice is a city where almost every building tells a story. I’m glad you liked the post.